Meringue GirlsThe cold nights, crisp air and freezing temperatures have arrived; winter is well and truly on its way. However, for many people, this isn’t a bad thing! For it means that we can pull out our winter wardrobe, wrap up in gorgeous scarfs and get cosy and warm with our loved ones. Winter is an amazing time of the year, there’s snow falling, log fires burning and when the sun shines, everything gleams with that beautiful, wintery sparkle. Winter is often the most cost effective time to get married, most people long for that sunny, summers wedding. Therefore, you may have some spare money lying around, for when it comes to decorating your chosen venues. Think BIG when it comes to decorations this season! Gone are the days where a few flowers on the table suffice, we are thinking large… large centrepieces, bird cages hanging from the ceiling, trees wrapped in fairy lights, candles dripped in glitter. Create your own winter wonderland by adding snowflakes and icicles- give your venue it’s own sparkle. Winter 2013 is the time think bold. Add splashes of colour to your decorations and try to avoid all white. We think that emerald green works well in winter and it’s been a key colour for weddings during 2013. When you are considering your wedding decorations, try and set the scene in your head. Picture this… a large, white wedding marquee decked head to toe with wintery décor. Your guests will arrive and be wowed by your choices. Place large candles on every table, this will give you a romantic atmosphere and the perfect winter lighting. Drip fairy lights from the ceiling, entwine them with wooden decorations and let them twinkle above your guests. Use a subtle amount of glitter, sprinkling your venue here and there, and your big day will really shine. Winter 2013 is all about the long, flowing wedding dresses. Think tight corsets with beautiful, elegant trains. Illusion necklines and embellished skirts are perfect for this seasons’ wedding. Try adding the right amount of sparkle by picking out dresses with intricate jewelled detailing and pair it with simplistic jewellery. If you have a lot of sparkle on your dress then you could always consider not wearing a veil or tiara. Let your dress do the talking this winter. Winter 2013 is very feminine and romantic. We recommend choosing an ivory dress, or even cream, instead of pure white. It will add a softer feel to your big day, giving your overall look a vintage twist. Long sleeves and lace will work wonders this season. Add to your feminine look by wearing a fur shawl or stole wrap. This will not only help you to stay warm at your winter wedding but it can look great in photographs- very elegant and sophisticated. For your bridesmaids, think metallic- silvers, sparkles, gold and glitter. This is a great chic look for winter weddings and will really compliment you, as the bride. You could even wear metallic shoes, to tie together the whole look. Wedding cakes are forever getting bigger and bolder. Make a statement with your wedding cake this coming winter. We recommend choosing a bold colour, it may not necessarily be bright, but choose a colour that will stand out. Blues, greens and reds work really well. Ask your cake maker to design you a cake that mimics ruffles- a key trend for this coming winter. Or, if this doesn’t appeal to you, wow your guests with a unique and stylish cake topper. Keep your cake simple and find something to top your cake that really means something to you. Why not choose a big cake for your winter wedding? Create a large, tiered cake full of different frostings and flavours. Decorate it to fit in with your winter theme. Alternatively, create a large cake full of individual cupcakes. Bring together different flavours and styles, fruits cakes and victoria sponge work well together. 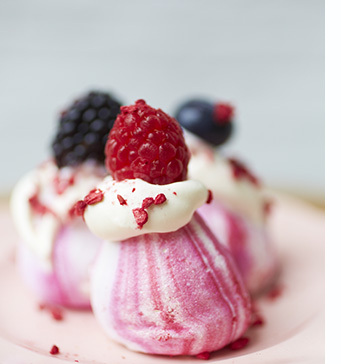 A style that we have fallen in love with is meringue cakes. These gorgeous designs, colourful and so creative, will be that perfect splash of colour that is necessary for winter 2013. This will be a big trend for the next coming year! Designed especially for your wedding, not only do they look incredible but we are sure your guests will be wowed too. Ombre design has been a key trend for 2013. You could always incorporate this into your wedding cake, cupcakes or even your meringues. Choose a colour, for example red, have different tiers in different shades. We recommend starting with your darkest red at the bottom and working your way up to white, decorating with intricate flower detailing as you go. Complete your on-trend 2013 winter wedding by selecting the perfect flowers. Again, it is all about using pops of colour. Try arrangements made up of pure whites and vintage ivories, mixing in berry tones and deep reds. Use wintery plants such as thistle, eucalyptus and lamb’s ears to give it that final seasonal touch. Amaryllis flowers works well in the winter- just add greenery and this will be your perfect wedding bouquet. Don’t forget, you could always use these on your tables too. These are just some of the key themes that are trending for this coming winter. Hopefully this has inspired you with ideas on how to plan the perfect, romantic, winter wedding. How are you deciding to plan your big day? Let us know by liking us on Facebook and tell us all your 2013 wedding plans.